Learn what we found out from nutrition educator Sheri Zidenberg about the benefits of a school garden and the resources you can use to put a garden into your school! Super Kids Nutrition is always on the lookout for new ways to get kids excited about fresh food and healthy living! We had the opportunity to speak with nutrition educator and co-director of the UC Davis Center for Nutrition in Schools (CNS), Sheri Zidenberg – Cherr, Ph.D. based in Davis, California. Garden-based learning is an educational strategy that uses school gardens to supplement instruction in a variety of subjects. Growing the garden creates hands-on activities for the students in math, science, language arts, history, environmental studies, nutrition, and health. Nutrition to Grow On, the garden curriculum we developed and used in our research, actually incorporates core educational standards into the curriculum with excellent results. Students increased their nutrition knowledge and food preferences! 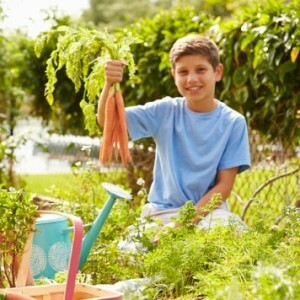 We need to get kids to like more healthy foods, garden-based learning does this. Why should parents & teachers be interested in a school garden? Everyone is already so busy, what are the benefits of implementing school gardens & using them in the curriculum? It’s a fun way for kids to learn! Especially with teachers that have such a large amount of responsibility within a standards-based education setting – they need a curriculum that utilizes those standards within their teaching area. Using garden-based education, you can teach a variety of subjects and it’s a hands-on, enjoyable learning style for children. In addition to improvements in health and food choices, studies have shown improvement in test scores, self-esteem, social interaction, and behavior! That said, we may not see any sustained learning in terms of nutrition and behavior change until parents are part of the whole program. Parent involvement makes a big difference. Our Nutrition to Grow On curriculum and many of the garden-based curriculums available out there have found that it’s really beneficial to get parents involved, whether it’s a take-home newsletter or activity sheets. A major part of the Nutrition to Grow On curriculum is take-home activity sheets the children complete with their parents. What are the first steps teachers and parents can take to start a school garden? 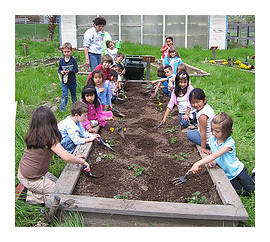 What programs are available for schools to implement school gardens? Parents & teachers can get together and form a team. Put the word out to the school community to see who has garden experience. We’ve found in our studies that you really need parent involvement as well as a garden coordinator, an individual who is responsible for bringing the team together and committed to implementing and maintaining the garden. There are often small community grants offered by Home Depot, Lowes or Wal-Mart. Check to see what’s available in your area! Our website at the UC Davis Center for Nutrition in Schools, https://cns.ucdavis.edu/, provides a wealth of information and free resources for use throughout the school community. We have information regarding current programs available that have been incorporated into the standard based/core curriculum with excellent and exciting results! What are some strategies and tips you can offer for parents and teachers who would like to implement a school garden but don’t know how to approach it with their school’s administrator? Again, it is important to form a team of parents and teachers. They must then do the research and know what resources are available. When approaching the school administration, bring in all the evidence that a school garden can benefit children’s learning and their long-term health. 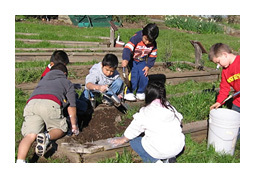 The UCD Center for Nutrition in Schools has numerous research papers that support a school garden curriculum: https://cns.ucdavis.edu/resources/research/. What challenges do you face from the school district when implementing a school garden? How can parents and teachers overcome this? It’s really time and availability of garden-based curriculum that is the biggest challenges. Teachers are worried they don’t have time. Principles are worried the teachers don’t have enough training in the standards-based curriculum for use in the garden. Teachers and administration aren’t aware of the resources already available for use – oftentimes for free! The key to overcoming these challenges is to know what resources are available. The Center for Nutrition in Schools has information regarding available curriculum and training at https://cns.ucdavis.edu/resources/curriculum/index.cfm. The Nutrition to Grow On curriculum is also available for free on the California Department of Education’s website: https://www.cde.ca.gov/ls/nu/he/nrttogrow.asp. 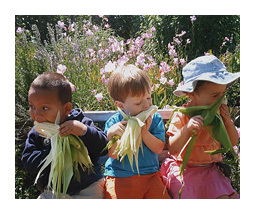 School gardens may offer benefits that go beyond the classroom. What benefits have you seen in your research? What does this mean long-term to a child’s overall well being? One of the benefits we saw was the children’s ability to make healthier choices and contribute to the choices of their family. We saw in the earlier studies with Nutrition to Grow On that children felt more confident to ask their parents to buy specific fruits and vegetables – they were more knowledgeable as a result of the school garden. Children were also more willing to try fruits and vegetables as a snack, where they would never have before. They were able to help their entire family to make healthier choices! Who’s responsible for maintaining the school garden during the school year and more importantly, during the summer? The garden coordinator of the team is usually responsible for maintaining the garden. The coordinator may not actually do the work but will organize a rotation schedule or team of volunteers to take care of the garden throughout the year. Is this coordinator usually a parent? If you could only get one message out to parents and teacher regarding school gardens, what would it be? Garden-based learning is a great environmental tool to teach children academics, appreciation for the environment and long-lasting nutrition and lifestyle skills. They say it takes a whole village to raise a child – that’s really what is required to improve children’s nutrition. We want children to realize that it feels better to eat healthier foods and to make changes for life. Changing the food selection at schools and forcing kids to eat it is simply not enough. 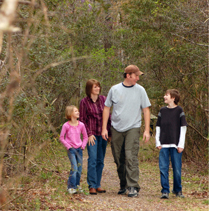 Check out our tips to start a family garden and how gardening yields more than just crops! You can view all of our nutrition and health expert interviews for everyday tips to healthy living. Jessica is a California registered dietitian who specializes in medical weight management. She currently works as a Senior Health Educator for Kaiser Permanente and the owner of Simply Balanced Nutrition & Wellness in Lodi, California.